MILWAUKEE (Wisconsin) • Rookie Lonzo Ball, the No. 2 overall pick in this year's National Basketball Association (NBA) Draft, has had a rough start to the season. The Los Angeles Lakers point guard had the second-worst field goal percentage (29.2) in his first 12 games, behind only the San Francisco Warriors' Wayne Hightower (26.8) in the NBA record books. 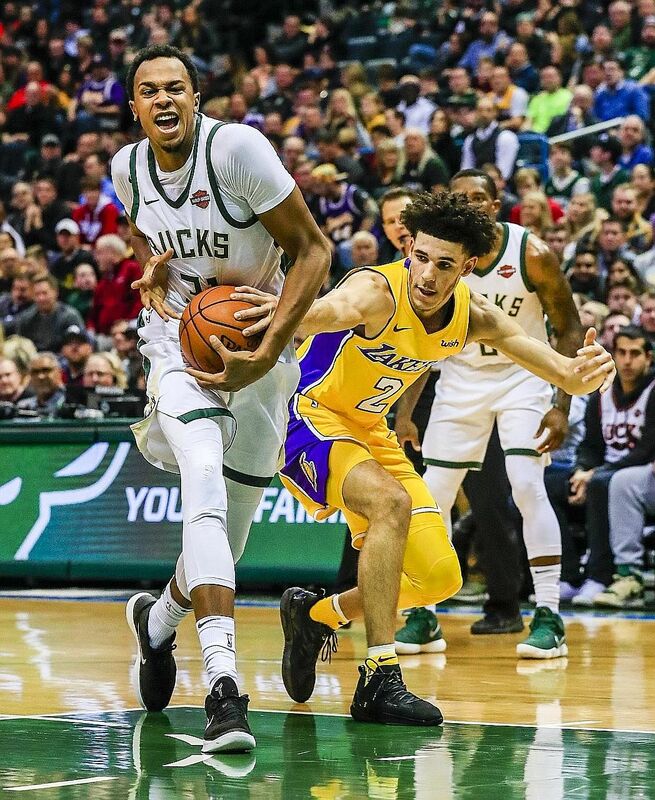 On Saturday, he finally created the right kind of history, becoming the youngest player to record a triple-double but it was in vain as the Lakers lost 98-90 to the Milwaukee Bucks. Ball, at 20 years, 15 days old, finished with 19 points, 13 assists and 12 rebounds, as the struggling Lakers lost their third straight game. He completed the triple-double by getting his 10th rebound early in the fourth quarter. He had 13 points and 11 assists at the time. He surpassed the mark set by LeBron James, who was 20 years, 20 days old when he recorded a triple-double on January 2005 for the Cleveland Cavaliers. "I really don't care," Ball, who shot 58.3 per cent from the field in the game, said of making the mark. "We took a loss. It don't really mean nothing. "I just wanted to win tonight. I thought we were in good position to get it but it didn't happen." He made seven of 12 shots from the field, including three of five from the three-point line. 62 per cent of the Lakers' 21. None came on the offensive end. He also had four blocks, three steals, four turnovers and three fouls in 38min 48sec. It was his best shooting game since he went six for 13 in a victory over the Detroit Pistons on Oct 31. Lakers team president Magic Johnson said of Ball: "You can see that, he is going to get triple-doubles in the regular season. "Just like me, when I got here, there was pressure. I was the No. 1 pick (in 1979). "I didn't care about that. I am going to play my game. Lonzo is going to play his game. The league's leading scorer Giannis Antetokounmpo had another big game, scoring 33 points to lead the Bucks (6-6). The forward is averaging 31.7 points per game this season. Milwaukee also got 16 off the bench from Malcolm Brogdon at the Bradley Center arena. Khris Middleton added 13 points while Eric Bledsoe contributed 11 in his home debut. Kyle Kuzma led Los Angeles with 21 points, Julius Randle had 17 and Brook Lopez added 10 points. In Oakland, Kevin Durant scored 29 points as the Golden State Warriors beat the Philadelphia 76ers 135-114 and notched their sixth straight win. Klay Thompson added 23 points and Stephen Curry contributed 22 as Golden State shot 57.7 per cent and made 53.8 per cent of their three-pointers. J.J. Redick scored 17 points for Philadelphia. In Dallas, Kevin Love recorded his ninth double-double with 29 points and 15 rebounds as the Cavaliers defeated the Mavericks 111-104. James and J.R. Smith added 17 points apiece for Cleveland. Harrison Barnes led Dallas with 23 points.